Emilie Towns, dean of Vanderbilt Divinity School, preaching at Union Chapel last Sunday. Vanderbilt University’s Dr. Emilie Townes apologized for bringing the Nashville heat with her to Oak Bluffs on Sunday. However, the Union Chapel audience saw no need for an apology. Rev. 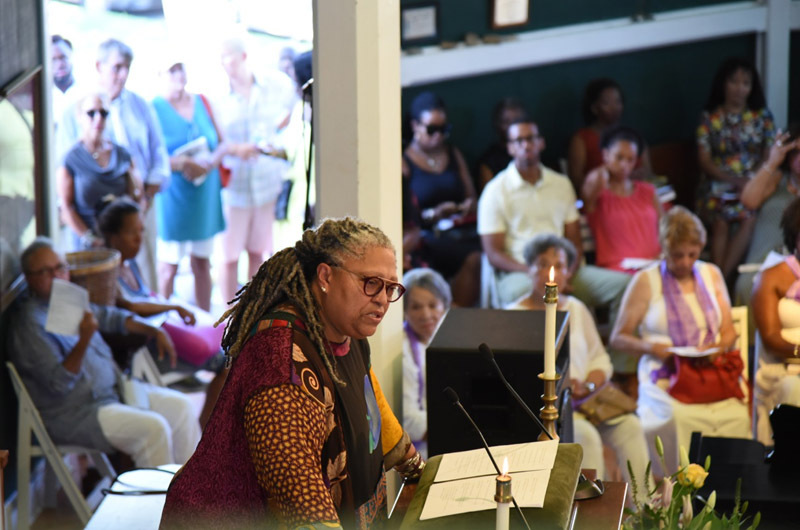 Dr. Towne’s powerful sermon provided the capacity crowd with enough uplifting inspiration during the Cottagers of Martha’s Vineyard’s 60th Anniversary Sunday service. Dr. Townes teaches theology at Vanderbilt University while serving as the Vanderbilt Divinity School’s dean. An ordained American Baptist clergywoman, Dr. Townes specializes in Christian ethics, womanist theology and cultural theory and studies. Her sermon reflected on her own family roots while instructing her audience to trust their own definition of wholesomeness, not that of others. She preached patience and encouraged people to serve their communities by sharing their unique gifts and living their lives with love, even in the face of hardship. 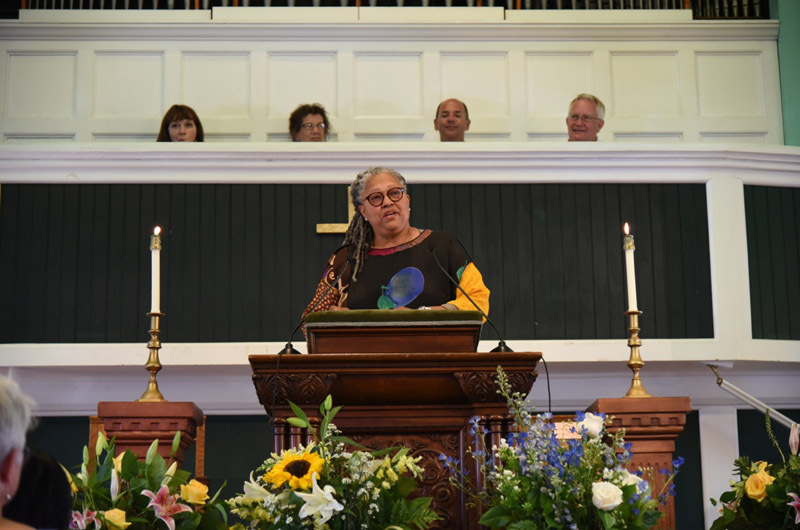 Cottagers President Olivia Baxter began Sunday’s 10 a.m. service announcing a monetary donation to Union Chapel. The Cottagers donated numerous flower arrangements for the service as well. Dr. Townes knew little about the Cottagers before the service, she said. The Cottagers began as a local philanthropic group for African-American women homeowners in 1956. They dedicate their time providing monetary assistance to various Island causes and scholarships. “My goodness, how did I not know about these women,” said Dr. Townes, reflecting on the Cottagers’ generosity. 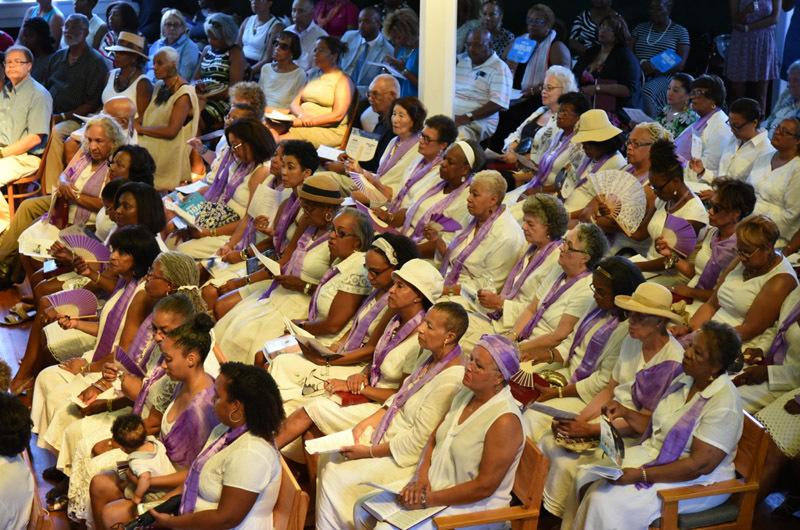 Mildred Henderson applauded Dr. Townes for acknowledging the Cottagers during their service. “I thought [Dr. Townes] was wonderful,” said Ms. Henderson, one of the oldest members of the Cottagers at the age of 91, and a board member of Union Chapel. Dr. Townes ended the service asking two things from her audience. She begged them to never let hate cloud their hearts and that each person leave the chapel singing their own “songs” for the world to hear.